Rewriting The Book presents - An RTB editorial (beta test) - WrestleCrap - The Very Worst of Pro Wrestling! Probably not what you were expecting when you saw “RTB” on a column header. Sorry about that. Anyway, welcome to the experiment! I’m trying out something new here … a way to stay in touch with you, the loyal fanbase, during the hiatuses (hiati?) between editions of the column. Maybe do some Q&A, or riffing on RTB ideas that never went anywhere, break news, tease upcoming columns, talk about current events, what have you. So, to answer the “when’s the next column” question … don’t know. No news from Simon or CG on their progress. Feel free to annoy them at their respective emails with guilt trips galore. They deserve it, the lazy bums (kidding, guys!). Mathew Sforcina, whose debut has been hyped so much it’s threatening to become Wrestlecrap’s version of Dr. Dre’s Detox, had a few other projects pop up that took precedence. Plus, he’s had trouble choosing his debut topic. He wants to impress his first time out and knows the expectations of the RTB fanbase are high, so he might also be a skosh nervous. If you’d like to give him words of encouragement, or just nag him to get off his lazy keester, by all means, do so. In the meantime, if you’d like to read his writing, go thee to 411’s wrestling section. He writes the Ask 411 column every Wednesday, and does a mighty fine job. If you dig in the archives and find his Evolution Schematic, that’s another treat. Very compelling reads, they be. What a handsome question, imaginary question-asker person! And the answer is … complicated. Problem #1 is that, since my semi-retirement, I’ve had three stories partially started but unfinished on the backburner, and it was always my intention to see them through. Goldberg was one of them. But I’m not feeling the fire from the remaining two. I have the basic outline of one story sketched out, “What if Bret Hart lost at Summerslam 1997?”, and it’s a great story … but the voice has proven elusive. The other story, involving the ramifications of Shane Douglas keeping the NWA Championship, I only have a rudimentary idea for a first act. Where it goes, where it ends, I’ve not a clue, and it’s so vast an idea, it can’t just be improvised on. Plus … you deserve the writing to be inspired, not forced. 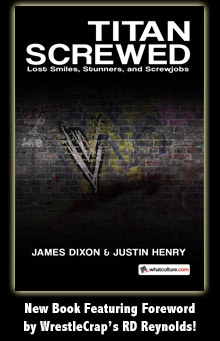 Inspired writing gets you “Who ran over Stone Cold?” and “DX invades Nitro”. Forced writing gets you “The Corporate Champion” and “The Invasion”. Your mileage may vary on those, but for me, those are my Music From The Elder and Trans. How badly did I date myself with those references? Problem #2: competition for my attention. Not on the family front, but from other writing projects. Something I hinted at in the Goldberg aftershow column was a project I was trying to get off the ground, being trying my hand at writing for Cracked. The first pitch crashed and burned. I’ve got a few more pitch ideas, but what’s hanging me up is I’m not a natural comedy writer, and I don’t have a bottomless well of comedic possibilities. A few ideas, yes, possibly some real funny ones … but I’m hesitant to start on this road if I think I can already see the end of it. So … that’s sitting there, waiting for me to make a decision. Another draw on my time is an ongoing vanity project of mine. If you’re not familiar with EWR (Extreme Warfare Revenge), allow me to explain: it’s basically a wrestling promotion version of SimCity, done all with a menu-driven interface. If you’re the kind who’s ever thought they could book a promotion and make it successful, it’s a good way to see if you’re right. A few of us from the forums created a forum of its own dedicated not only to EWR, but chronicling our ongoing games, presenting each “episode” of “TV” like a script or recap, complete with promos, match results, everything. I’ve been doing it for … oh, man, six years? Don’t know. Lost track. Anyway, it’s very fun, but writing the shows is also a huge time-sucker (and if you’d like to read the product of this ongoing effort, go here; bring a few lunches, though, because there’s a lot to catch up on). There’s also a third writing project that’s sort of standing in the way, but not quite … it depends really. It depends on you, dear reader. But that’s where you come in. I wouldn’t just want to put five or seven or whatever number of old columns in an e-book format, call it good and expect you to buy it. Why buy what you can get for free? No, there’s need to be incentive. It’d need extra, exclusive content. What would be good enough? Expanded, revised editions of old columns? A few new columns? Something I haven’t thought of yet? And what would be a good price? All questions that I can attempt to answer myself … but the answer I’m most concerned with is yours, dear reader. It’d be you buying said potential book, not me. So, here’s your homework assignment, dear fans. You tell me, because if this has a chance, you’re the ones putting an Alexander Hamilton in my pocket. Would you buy an RTB book? What’s a fair price? What kind of extra content would you get you interested in buying it? And on that note, what would you like you to see in future installements of RTB Editorials? Don’t hold back. All cromulent ideas will be considered. This column cannot be embiggened enough. So send me your ideas at jed316@msn.com, leave a comment or hit me up on Twitter @zeteticbynature. Hopefully, I’ll get enough ideas and content to make this pretty regular … at least, I figure every couple weeks. Sound good? Cool. Cool-cool-cool. 31 Responses to "Rewriting The Book presents – An RTB editorial (beta test)"
And I would be the first in line to buy a RTB Book sir. I still love to read to DX getting into the scope story. Personally, I think The Corporate Champion and The Invasion are every bit as good as Who Ran Over Stone Cold? Also, I suggest getting what EWR has evolved in to, Total Extreme Wrestling 2013. Glad somebody liked them. They just never sat proper with me, moreso Invasion. But I think I’ve mentioned that once or twice. I tried TEW ’05 when it went freeware a couple years ago. WAAAAAY too complicated for me. If I was 18 and had all the time in the world, I could work with it. But it’s just too many options for me now. EWR has its limitations, but I can work with it well enough. I love RTB, always get excited when I see a new one come up. I was pretty sad when the Bret Hart and Hulk Hogan ones didn’t get finished. Two things I have pondered as I hunt sheep in my head late at night. First, what if the Honky Tonk Man had beaten the Warrior at Summer Slam 88? And the other is what if the Million Dollar Man had won the Wrestlemania IV tournament? Not sure if there’s much mileage to either, but would be fun for me at least. I’d be more inclined to the former over the latter, only because I’ve already done something involving Ted DiBiase becoming champ in that timeframe. But still both good ideas. Hey, I’m going to be 21 in two months, and I understood your references. That being said, I understand where you’re coming from. I wrote a Gorillaz fanfic two years ago, (yes, a fic about the cartoon band) and never got past chapters two or three, ’cause I had no idea where to take the story from there. And yes, I would buy a RTB book. I read them here when I get bored, so it’d make for some pretty cool reading. Depending on the length of the book, I’d say $20 should be the maximum price. You give me hope for the future, young man. I’m known for writing what amounts to alternate history pro wrestling fan-fic. I am in no place to break someone’s stones for writing a Gorillaz fan-fic. Any muse is a muse worth pursuing. Also I would try to make this book as cheep as possible this is not a knock against your writing but I can’t really see myself paying $10.00(American damn it!!! lol) for what is basically wrestling fan fiction. But if all else fails do what everyone else does and write exclusive stories for said book, I would suggest What if Ric Flair or Hulk Hogan didn’t leave the WWF in 93 (With a WWF and WCW side in the case of Flair) and What if Hall and Nash didn’t leave WCW in 96. Any particular stories you’d like to see expanded? This venture would be an ebook, so getting signatures would be, obviously, not an option. Cool idea otherwise. As for extra’s writer’s commentary to go along with the stories and shed some light on what inspired you to write each twist and turn. Any word on Shane, Jed? He tweets occasionally, mostly to shill stuff, but I haven’t seen any kind of writing from him since last summer. Haven’t heard a peep from him in a few months. And I didn’t even know he was on Twitter. Love the idea of an RTB eBook! The format of the ones you’ve done so far would look very nice in an eBook format. Go for it! I would totally pay $15-20 for a RWB book (sorry, had to mentally translate my first thought into dollars there). I’ll admit, I’ve liked all of the ones I’ve read (I skipped a few of the older ones because I didn’t think I’d recognise any of the names). I’ve actually loved the WCW ones more than I expected to, despite the fact that we didn’t show it in our house when I was growing up. I’d like maybe more stories in the style of the Norfolk Scope RWB, as looking back on an event where things changed and leading on from there, because that was awesome. What if Andre The Giant didn’t give Ted DiBiase the WWF Title at the Main Event? What if Stone Cold had lost at Fully Loaded 99? What if Eric Bischoff had gotten a TV deal and kept WCW on the air? What if “Macho Man” Randy Savage had been allowed to compete at Survivor Series 1991? What if Rob Van Dam hadn’t gotten injured in 2000? What if Goldberg had continued to go after the nWo in 1999? What if Mr. Kennedy had been revealed as Vince McMahon’s illegitimate son? What if Eric Bischoff hadn’t hugged Vince McMahon? What if Shawn Michaels hadn’t injured his back in 1998? What if Hulk Hogan had never gone to WCW? 1. What if Roddy Piper and Paul Orndorff defeated Hulk Hogan and Mr. T at the first Wrestlemania? 2. (I have no idea how you can even pull this one off) What if the first Wrestlemania failed? Well, technically, the first one could lead to the second … but looking at them independently, the second one intrugues me more. Not sure where it would go … without WWE rising up, Crockett never has to try, and wrestling stays in territories. Hard to do a birds-eye-view of an industry if it never becomes an industry. Still … compelling. A few of these I’ve had on The List for a long time, especially the Austin/Fully Loaded story, Fusient buying WCW, and Shawn not getting injured. What if the MSG curtain call never happened? What if Hogan never went to WCW in ’94? What if the Sid/Arn incident never happened in ’93 and Sid got Vader at Starrcade? What if another network (say FX) picked up ECW after TNN dumped them? What if SummerSlam ’92 was held in Washington D.C. instead of London? None of those have been done. Most have been considered but never acted upon, only for lack of inspiration at the time. You should listen to Heyman on the Ross Report. He actually gives you the first few steps for where ECW would have gone had On Demand paid them what was owed, and I think that’s a story. – What if Jeff Jarrett hadn’t blackmailed Vince for the Intercontinental title in ’99? – What if Mike Awesome hadn’t signed with WCW when he was ECW champ? – What if Mick Foley hadn’t left WCW in ’94? The Kerry Von Erich one is very intriguing as well as someone else’s comment about ECW finding a new network. Based on some of these suggestions, I would definitely pay for an anthology series of RWB if it ever comes to be Jed. Always loved reading these RTB stories, heres a suggestion just for laughs! -What if the Shockmaster didnt trip during his entrance? I think he could have been the greatest of all time and totally reshaped the industry! I would love to see a rewritten version of the Invasion story. While it’s not as bad as you seem to consider it, it definently could be a lot better. Personally, I’d love to see a RTB if Razor and Diesel hadn’t left WWF for WCW or if Sting had been the 3rd man at Bash at the Beach ’96. 1. What if Brock Lesnar hadn’t left the WWE in 2004? 2. What if Eddie Guerrero hadn’t died? 3. What if Rob Van Dam hadn’t gotten suspended during his WWE Title Reign? 4. What if Jeff Hardy had won Money in the Bank in 2008? 5. What if Stone Cold could’ve competed at Survivor Series 1999? 6. What if Stone Cold hadn’t turned heel at Wrestlemania 17? 7. What if John Cena didn’t get injured before No Mercy 2007? 8. What if Undertaker returned at Royal Rumble 2000 as planned? 9. What if CM Punk didn’t return to the WWE so quickly in 2011? 10. What if the “Higher Purpose” of the Nexus was revealed? 11. What if John Cena turned heel while a part of the Nexus? 12. What if Edge didn’t have to retire after Wrestlemania 27? 13. What if Jeff Hardy didn’t leave WWE in 2009? 14. What if The Rockers had reformed in 2006 as planned? 15. What if Triple H didn’t get injured in 2001? 16. What if Matt Hardy’s return WWE return hadn’t failed? 17. What if Booker T won at Wrestlemania 19? 18. What if Bobby Lashley won at The Great American Bash in 2007? 19. What if Vince Mcmahon didn’t turn on The Rock at Wrestlemania 2000? 20. What if Matt Hardy didn’t turn on Jeff Hardy at the Royal Rumble? Sorry if this too much, but I had so many ideas and didn’t know which ones you would be able to use so I listed all that I could think of. I also thought of “What if Kennedy was revealed as Vince Mcmahon’s son?”, but that was suggested already. Plus, based on the RTB columns I’ve read so far, I’m confident you would do a great job with any of these. Hope these ideas are good enough ideas for you!